John Goddard Set Goals — So Have We! With the idea of exploration and adventure still in mind, we thought about John Goddard and the goals he set for himself when he was 15. We got to thinking … what might we like to do, to accomplish, to see, to experience, to master in the life journey ahead. Each student made a list of at least 25 goals. Then we made a video of ourselves sharing those goals. Below is a shortened version of our video – a sampling of what 5th graders see themselves capable of achieving. It all begins with a goal … and then step by step we’ll learn what to do to make it happen! The topic of exploration has always fascinated me. The idea of experiencing the unknown kind of makes my toes tingle in the same way that being in high places does. Just think about it. An explorer takes all kinds of risks! An explorer needs to be resourceful, brave, prepared, and maybe even a little bit crazy. It must be hard to be prepared when you’re not sure what you’re getting into or what you’ll find. A successful explorer no doubt needs to be able to think on his or her feet, meaning he or she must be able to solve problems. A successful explorer won’t be the kind of person who gets stuck on an escalator and then stands there yelling for help! We are all explorers of sorts. We might not all be climbing mountains, flying off into space, or digging up dinosaurs. Many of us are exploring our own abilities. I remember that when my son was taking karate classes, I decided to give it a try myself. I was exploring karate and myself at the same time. I learned about the self defense aspect and the discipline required to focus on the various forms. I learned that I became very nervous each time I tested for a new belt. I learned that I loved the feeling of passing the test and earning the next rank. I made it all the way to brown belt! I’m still proud of that accomplishment. I’ve always tried to find new things to learn and new goals to accomplish. Last year I ran a 7k race and came in third in my division! Running wasn’t anything I ever did. But I became determined to set myself a running goal. My first goal was to run a 5k. Once I accomplished that, I raised my goal and ran a 7k. I can’t even clearly explain how amazing I felt when I crossed the finish line. Thinking of my own experience with learning and trying new things, I can only imagine the emotions that an explorer feels. There must be moments of uncertainty, fear, and discouragement. There are so many things that could go wrong! An explorer must have a drive to keep going and not give up. And if the feeling of accomplishment that an explorer feels is anything like the feeling of accomplishment each of us feels when we succeed at something that was not easy to complete, then I understand why there is still exploration in the world. As I see it, the difference between an explorer and someone like myself is the level of risk and the level of commitment. I explore new skills and new learning, but I don’t take myself to remote areas of the earth for months at a time or put myself in dangerous situations in order to accomplish my goals. Each student in the class is currently researching an explorer. What are each of you finding out about what it takes to explore the unknown? What kind of person was (or is) your explorer? Do you think that today’s explorers are different from the explorers that left Europe in the 1500’s? Are the reasons for exploring today different than the reasons for exploring back then? A few days ago I read aloud an article about an explorer named John Goddard. He is a remarkable man. When he was 15 years old, he made a list of things he wanted to accomplish in his lifetime. Click on this link (John Goddard ) and watch the video there. The video was made in either 1998 or 1999, but it is worthwhile. Then click on John Goddard’s list of goals. As you are glancing through the list, think of a connection between your explorer and John Goddard. Then make a comment to this post. Explain your connection and tell a bit about your explorer. Please keep in mind the comment guidelines and our new goal of a 3-4 sentence minimum. Skype Visit With Derek the Ghost! Derek still loves making kids laugh. It is his goal that his readers laugh out loud when reading his books. We eagerly let him know that he indeed made us laugh out loud many times. We weren’t surprised to learn that he was a big Roald Dahl fan. He’s read all of Roald Dahl’s books! He’s also a fan of Louis Sachar. In fact the Sideways School books really gave Derek ideas to think about. In creating characters, he was inspired by teachers, people he has known, characters in other books and movies, and himself! Dr. Dragonbreath is based on a teacher in Derek’s past who always wore a tie and unfortunately had a case of dragon breath! Charles Nukid is a character that Derek relates to. 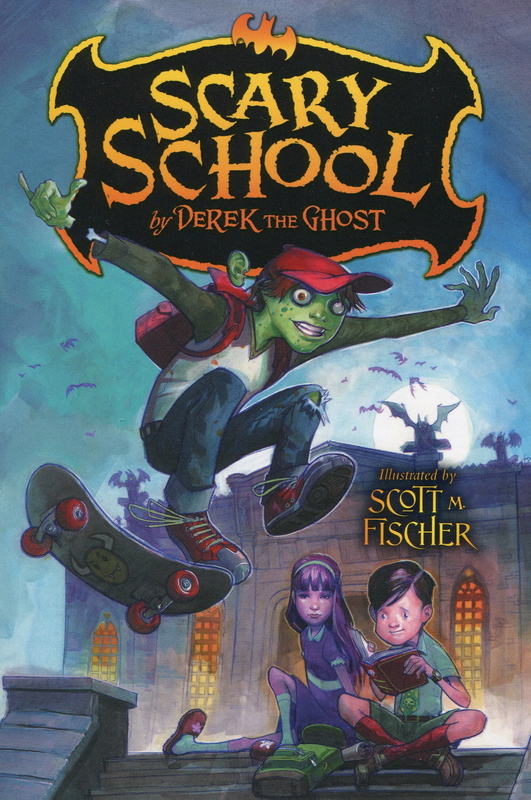 As a student in school, Derek was also kind of skinny. Steven Kingsley is based on the author Stephen King. The character, like the author, likes writing and baseball. 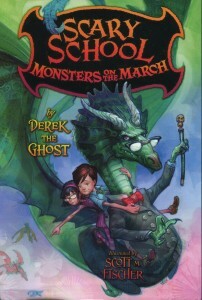 Derek is the only author in his family, but he did mention that his mother is a very talented artist. If you google her name you can see some of her art. Her name is Melanie Taylor Kent. 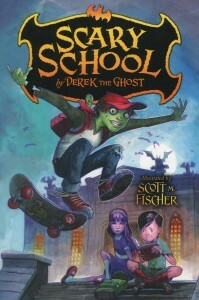 When asked if he is planning a fourth book in the series, Derek said he actually had a plan for each of six books, but only had an offer from his publisher for the first three books. We’re planning on writing persuasive letters to his publisher to let them know how much we’re enjoying the Scary School series and how much we would love to read more! We may also write persuasive letters to Nickelodeon to support the idea of his books being made into a series for TV. We have become big time fans of Derek Kent. We hope he writes many more books! How is writing like sculpting? What I loved about this activity is the fact that the students were enthusiastic to do the sculpting and were willing listeners as they worked. To begin with, each student received a small container of Play-Doh. The following questions were the focus of the lesson. What process does a writer go through to produce a final piece? How is a writer like a sculptor? 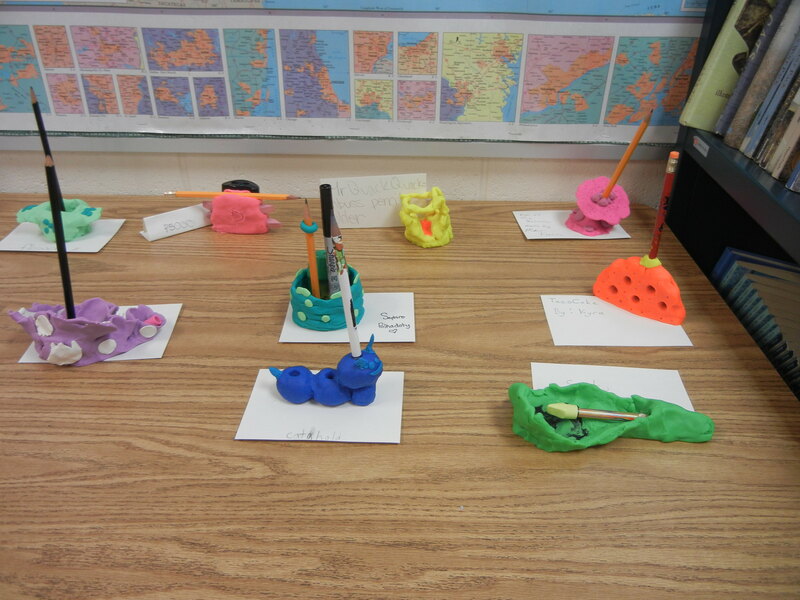 As the students began to work the Play-Doh in their hands, I reminded them that as clay is the material a sculptor uses, words are the material of writers. It is important for writers to play with words, experiment with words, find out about words. As they continued to stretch, press, and fold the Play-Doh, I spoke about the two parts of a writer or sculptor that have to work together to produce a final piece. These two parts are the creator and the critic. In the first stages of writing, the creator has a much bigger part. The creator is the uncensored part of the writer or sculptor that envisions ideas, brainstorms possibilities, and thinks of all sorts of ways to do something. The critic is the part that makes decisions, analyzes, revises, or edits. If a writer hears that voice inside starting to judge while he or she is still in the prewriting stages and still just getting ideas for the writing, the writer needs to tell that critic voice to be quiet and wait his or her turn. After having described the creator and the critic and allowing everyone time for work with the material, it was time to tell everyone what they would be creating. First they were told that the something each was to create would be put on display for their classmates to see. That helped establish who the audience for the sculpture would be. Then they were told that the sculpture they were creating needed to serve a purpose. Knowing why we are writing something helps us set a path and destination for our writing. Their task was to create a pencil holder. But before beginning, each was asked to set aside a small ball of Play-Doh (about the size of a pinky from the tip to the first knuckle). Now they could begin the first of many ideas they would come up with. This was not the time to pick a final design, but rather to experiment with lots of ideas. While they worked I talked about what a writer’s purpose could be. For instance, it could be to describe something, explain something, tell a story, get rid of anger or sadness. It could be to persuade, give information, or maybe just find out what he or she thinks. As a sculptor, their purpose was creating a pencil holder. Then I ask them to mush up the Play-Doh again. They moaned. While I understood their disappointment, I wanted to prove that there were a thousand more ideas where that first one had come from. That creator in each of us is always anxious to give more ideas. As they began again, I spoke about how this could be considered presculpting in the same way we do prewriting. In this stage the creator is at work and the critic is asleep. To help them stay focused, I asked them to ask themselves, “What am I trying to accomplish? How do I want my audience to feel?” After a few minutes of watching them develop these new sculptures, I once more asked them to mush up their designs and begin a totally new one. Before they began on this latest design, I announced that this would be their first draft. We discussed as a class what the criteria for judging the pencil holder would be. It was decided that the pencil holder needed to be interesting to look at and needed to securely hold the pencil. At this point they let their critic help them decide whether or not to use one of the previous designs or to create a new one. This time they had five minutes to finish this first draft. Now it was time to stop and get some feedback. Each asked a partner if it was clear where the pencil would go. Now that we had gone through the stages of rehearsal (coming up with lots of ideas) and first draft (getting the essential meaning) it was time to revise. Students were asked to look again at their piece. They looked at it from the side, from the top, even from a distance. They thought about what to refine. Then they asked their partner and listened to ideas for improving their design. A few moments were given for changes and revisions. Next it was time for the final stage — editing. I explained that at this point a writer looks closely at things like spelling, punctuation, grammar, and capitalization which make writing clear and readable. For the sculpture, the editing came when each student traded the little ball of Play-Doh with someone else. Then, with a new color, each added details to the sculpture. 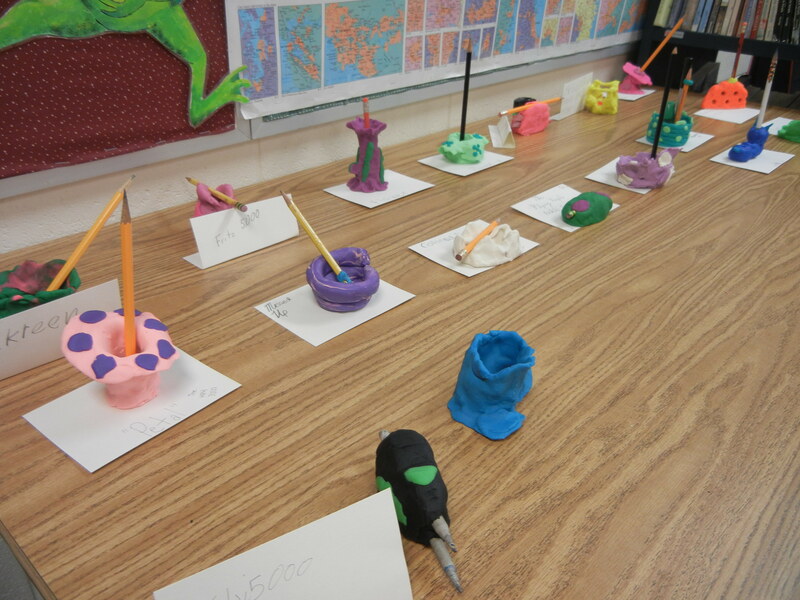 As each finished, the pencil holders were given creative names and displayed on the front table. We admired each pencil holder and complimented one another on design and creativity. I found this activity at the NCTE (National Council of Teachers of English) site. I’m excited to share what we’re doing in our classroom and also to extend our learning by having my students respond to posts here.